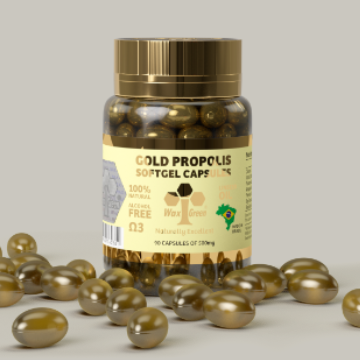 Our Propolis in Capsules has always been produced with pure Green Propolis without any addition of oil, alcohol or water. But now we have added vitamins C and E making it a powerful food supplement in the prevention of diseases in general. Place of Origin: Rosemary field blossoms from Minas Gerais state, Brazil. No. 61 - Flask contains 60 x 500mg capsules. Minimize side effects of aggressive treatments against diseases such as cancer, ulcers and AIDS. Used daily as a dietary supplement, helps prevent degenerative diseases, typical viral respiratory tract infections, and various types of inflammations. Propolis stimulates the immune system, protecting the human organism against a wide range of illnesses. Take 1 capsule daily for prevention, 2 capsules daily for therapeutic use and 3 capsules daily in case of chronic conditions. Take it 20 minutes before meals with water or fruit juice. Warning: Propolis is an excellent co-adjuvant to conventional treatments, but should not and under no circumstances replace the medication prescribed by your doctor. There have been rare cases of allergy to Propolis, but in case of allergic reactions, discontinue use immediately and consult a physician. Visit our www.propolis.com.br. For suggestions, information or complaints, please email waxgreen@waxgreen.com.br .